Laden with health benefits and super versatile, it’s no wonder quinoa has been labeled a superfood. Pronounced keen-wah, this grain-that’s-not-a-grain (it’s actually a seed) is brimming with protein, fiber, vitamins and minerals. Quinoa is a superfood staple among for many reasons. It’s tasty, it plays nicely with other foods and it’s easy to prepare. But the main attraction for us plant-based advocates is that quinoa is a complete protein. It’s certainly not difficult to get enough protein on a vegan diet, but when you find a superfood that contains all the essential amino acids that your body needs, of course it’s going to be appealing. Quinoa is incredibly rewarding to work with. Unless you forget it on the stove, it’s pretty much impossible to mess it up. Even if it’s your first time in the kitchen (welcome! ), learning how to cook quinoa is super easy. Once you have a batch of cooked quinoa on hand, it’s time for the real fun to begin. Our hero staple is so easygoing that there’s almost nothing you can’t do with it. From salads and buddha bowls to porridge and burger patties, the world is your quinoa oyster. Because I’m a morning person, I’ve decided to showcase some quinoa breakfast bowls. My savory tummy only opens for business closer to lunchtime, so all of the recipes bar one are sweet. Hopefully you’ll enjoy them as much as I do, but if they’re not to your taste just ask Google for some savory quinoa breakfast bowl suggestions. Let’s get our keen-wah on, shall we? A combination of almond milk, fresh and dried fruit, nuts, seeds, spices and maple syrup make this fruit and nut quinoa bowl from Glue & Glitter a power breakfast of note. It’s easy to prepare and hearty enough to keep you going for hours. Minimalist Baker’s dark chocolate quinoa breakfast bowl is typically decadent. Dana certainly isn’t shy when it comes to her culinary creations. Cooked with a blend of almond and coconut milk, mixed with cocoa powder, vanilla and maple syrup and topped with banana, berries and dark chocolate, you could just as easily serve this bowl of goodness as dessert. I love blueberries. They’re the one reason I’m happy to put up with winter. So when I came across this quinoa porridge with coconut and berries from The Little Pine I knew I had to include it in this roundup. I mean, purple quinoa, people! Jess has included four recipes in this Youtube clip, and they all look really good. However, the one I want to draw your attention to is her miso quinoa bowl (5:09). It’s way too savory for me to even consider having for breakfast, but I also get that not everyone prefers their morning meals to be sweet. All the recipes are written out in full in the description section below the video, so no need to scramble for a pen and paper. Just enjoy watching Jess whip up these yummy dishes. 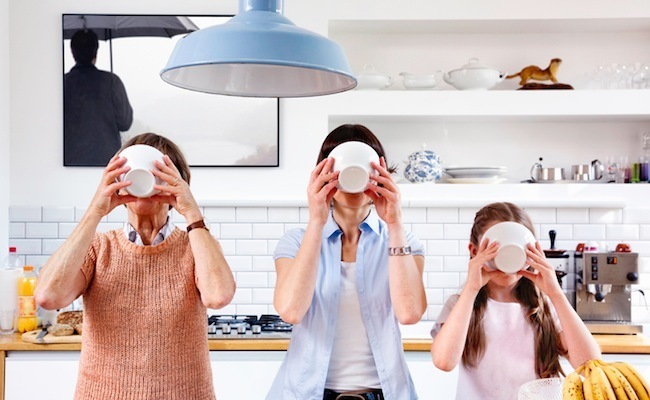 Aly Préville definitely surprised me with two of her quinoa breakfast ideas. I never thought of adding the cooked grain to a smoothie, but it’s tastier than it sounds. The smoothie had a nutty flavour I quite enjoyed. For someone who loves spending time in the kitchen, I’m also a little embarrassed to admit that it never occurred to me to toast cooked quinoa into a cereal. I was pleasantly surprised by the results. But if I have to choose, I’m going with the overnight quinoa. Soaked with almond milk, chia seeds, maple syrup, vanilla extract and cinnamon, the result is a perfect blend of breakfasty goodness. 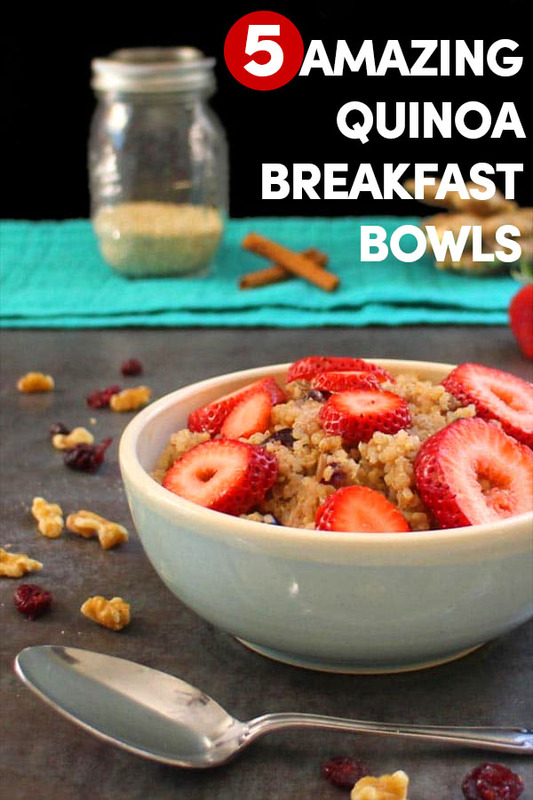 Photo Credits: Main photo via Getty Images, quinoa breakfast bowl photo via Glue & Glitter. Some good ideas here, thanks.